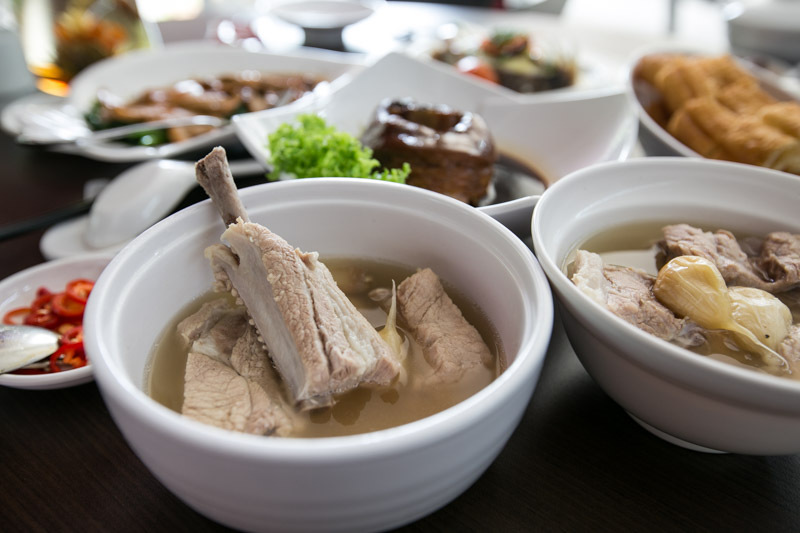 Pork Ribs Soup, better known to locals as Bak Kut Teh 肉骨茶, is a popular Chinese dish of tender pork ribs simmered in a flavourful, herb and spice-infused broth. 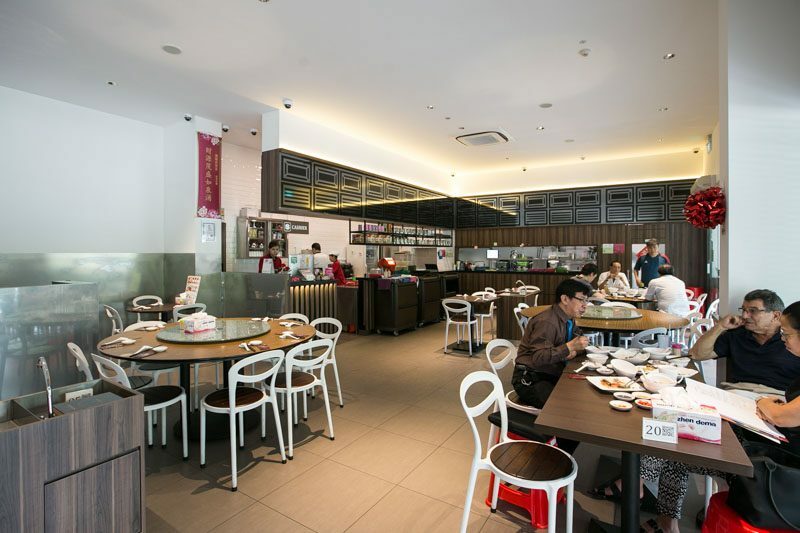 Whether you’re a Bak Kut Teh enthusiast, a frequent supper-goer, or merely someone who lives around the Keppel area, I’m sure many have heard of Outram Park Ya Hua Bak Kut Teh, which serves one of the best Bak Kut Teh that Singapore has to offer. 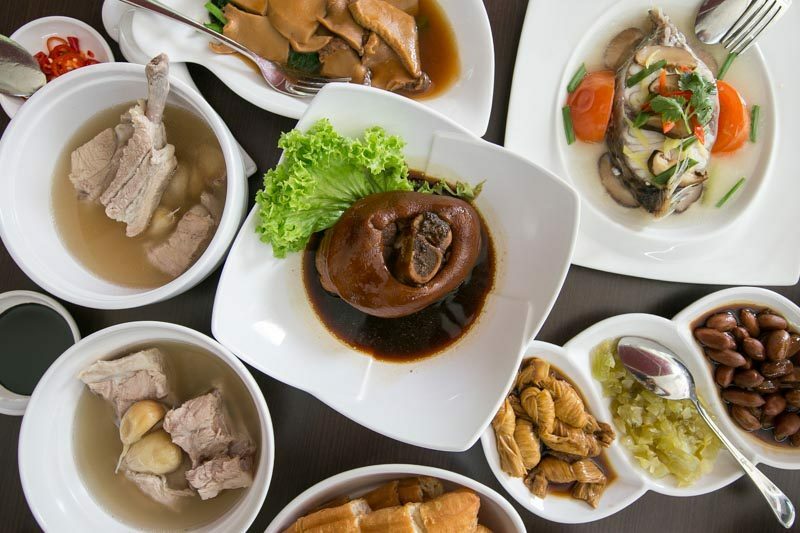 Fortunately, Mr Frankie Gwee (‘Ah How’), the owner of Outram Park Ya Hua Bak Kut Teh, has recently set up a Bak Kut Teh restaurant in Tiong Bahru, bringing the same tantalizing Pork Ribs Soup to more people. Nay, it’s even better since he is personally managing the restaurant. The new establishment goes by the name《团缘》 or ‘Tuan Yuan Pork Ribs Soup’. Before you raise issues with the apparent mistake in the Chinese characters: No, their Chinese name is not an error but a clever pun on words, with a deeper significance. The phrase 团缘 (Tuan Yuan) reads like ‘Reunion 团圆’, because their new restaurant stands in the exact location of Mr Gwee’s old home more than 40 years ago. The character 缘 (Yuan), meaning ‘Fate’, arises from Mr Gwee’s belief that it is fate that has brought his customers to his establishment, and allowed old customers to grow into friends. 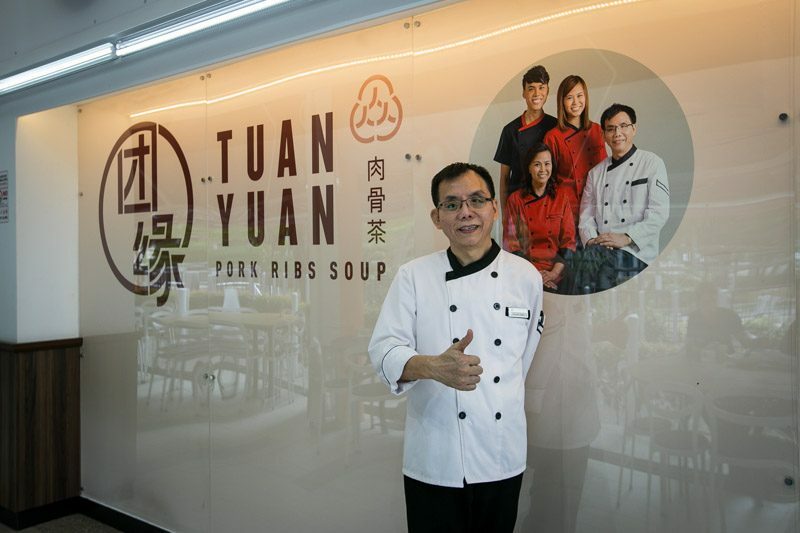 Tuan Yuan Bak Kut Teh is a family business and Mr Gwee’s pork ribs soup legacy is continued by the humble Gwee siblings, Mario and Fiona, who are actively involved in running the place. The place is rather homely, largely due to the attentive and caring staff. The restaurant is modern, air-conditioned, and retains a casual atmosphere for comfortable, easy dining. It is extremely spacious, with seating both indoors and outdoors. Also, the restaurant is conveniently located with a multi-storey carpark behind the restaurant so it’s super accessible to drivers. 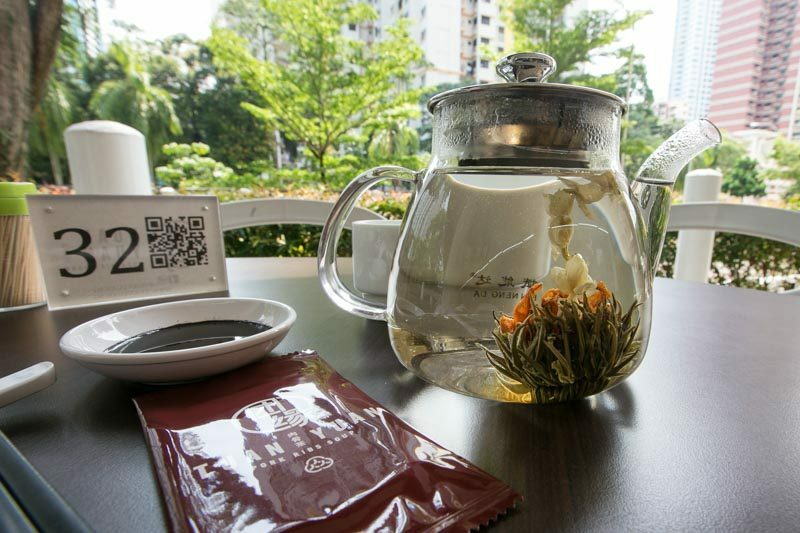 We started off our meal with their Floral Tea ($6/pot), putting the ‘Teh’ in Bak Kut Teh. Tea is taken alongside the Pork Ribs Soup because it apparently cleanses and dissolves the oil in the body so make sure you order a pot! The Tuan Yuan Bak Kut Teh Soup ($7/bowl) was brought to us steaming hot. I really liked the dense and peppery soup base, though Seth prefers a dash more herbs. Tuan Yuan’s soup comes with 3 different pepper levels in their mobile app (which I’ll elaborate later on), so adjust yours accordingly. The large cloves of old garlic were buttery soft and satisfyingly pungent. I personally like garlic, but if you’re not a fan, you’d best avoid biting down into them. The rich flavour of Tuan Yuan’s Bak Kut Teh arises from Mr Gwee’s insistence on using only quality ingredients like fresh (not frozen!) pork from Indonesia, Sarawak white pepper and old garlic. The bones are boiled for hours to get this richness. To emphasize how cooking with fresh pork is especially important for the soup to taste good, Mr Gwee even taught us how to spot fresh pork in Bak Kut Teh: the pork flesh must be light-coloured, not dark or reddish. 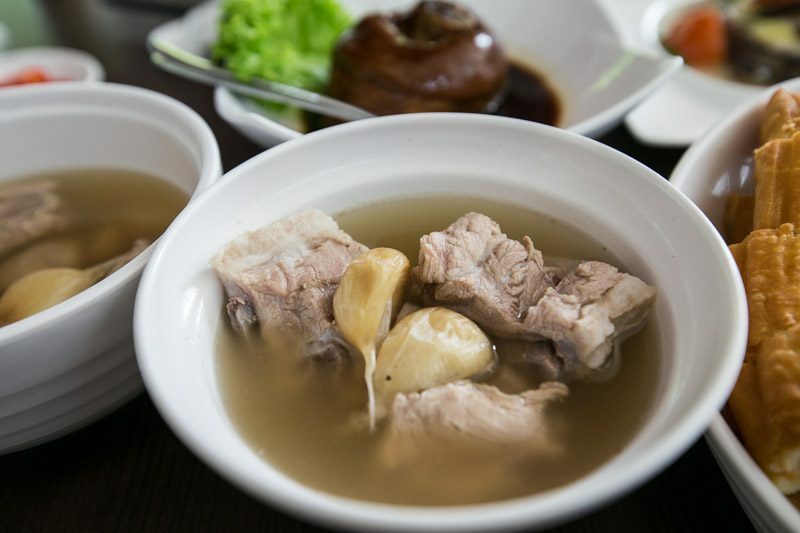 The simple yet wholesome ingredients used in Bak Kut Teh come with a plethora of health benefits: white pepper boosts the immune system, garlic has cancer-prevention properties, and bone marrow from boiled pork bones is very nutrient-rich. With so much goodness infused into the soup, it’s not only delicious but extremely nourishing. 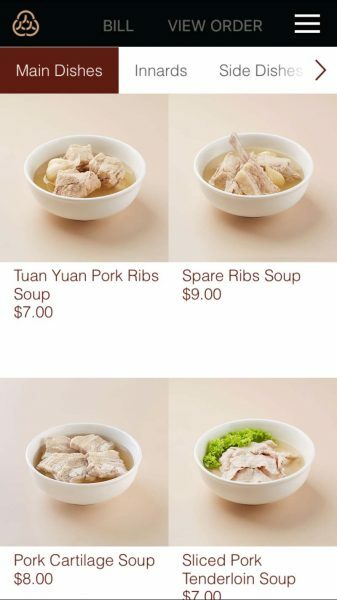 Tuan Yuan also serves up Spare Ribs Soup ($9/bowl), the same soup base with the option of fat or lean spare ribs. I really enjoyed this cut of meat, as the spare ribs were unbelievably tender and slid right off the bone, making them very easy to eat. As a side dish, you HAVE to get their Fried Dough Stick ($1.50/bowl), which is freshly fried with every order for ultimate crispiness. The combination of savoury soup and crisp dough is absolutely sublime. 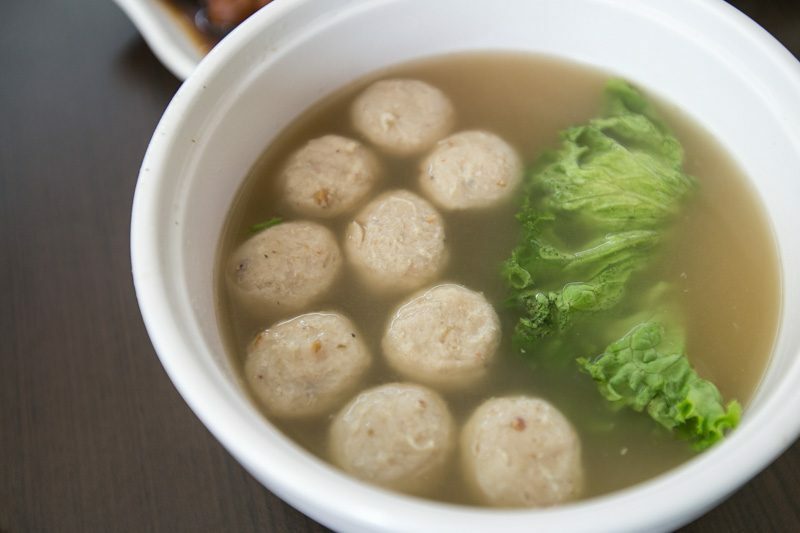 The Pork Ball Soup ($5/bowl) is a rather delightful alternative to having pork ribs. It comes with a generous number of easy-to-eat meatballs, so this will probably be a favourite with parents who are dining with young, picky children. 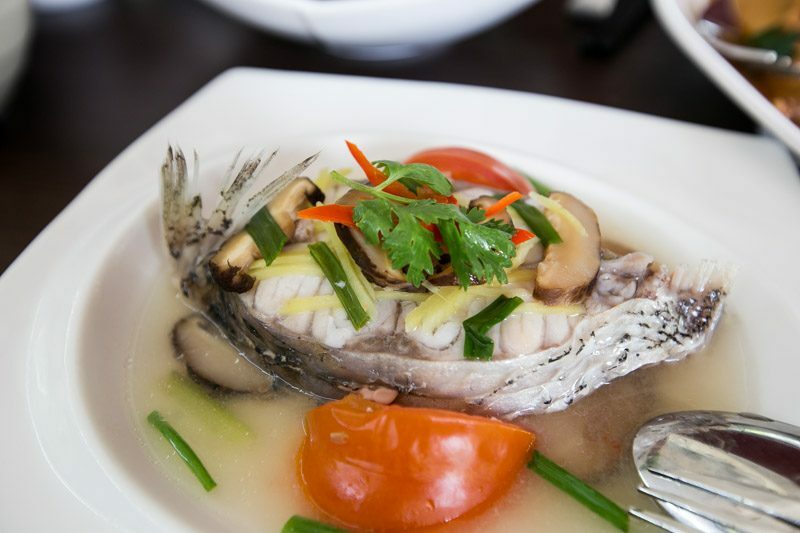 Tuan Yuan has also diversified their menu with other Teochew offerings, such as Steamed Threadfin Body ($15), which is quite a classic Teochew fish dish with clean, fresh flavours. I have to say, the Topshell in Abalone Sauce with Chye Sim/Watercress ($10/plate) was my favourite side dish. The Topshell was springy and delectable, while the Abalone Sauce had a well-balanced flavour, sweet and savoury in all the right amounts. I drenched my rice in the sauce and we swept this plate clean. It was that good. Besides that, there is also a good variety of braised items. If you like soft, sinfully fatty cuts of meat, you will like their Braised Pork Knuckle ($6/7/8), which is wobbly on the outside yet lean within. 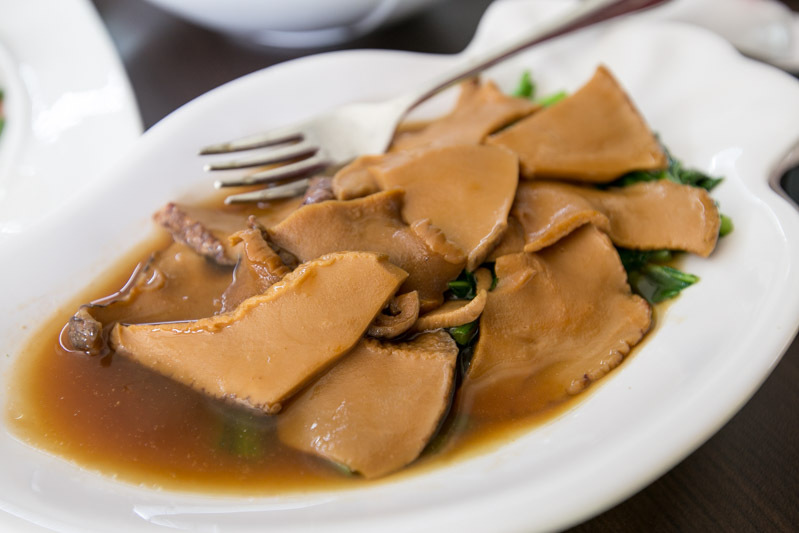 The Braised Soy Knots, Braised Peanuts and Salted Vegetable ($2.50 each) make good additions to any Bak Kut Teh meal, but I personally could do without the frills. Tuan Yuan means reunion after all, so what better way to finish off a family dinner than with Glutinous Rice Balls ($1.50/bowl)? 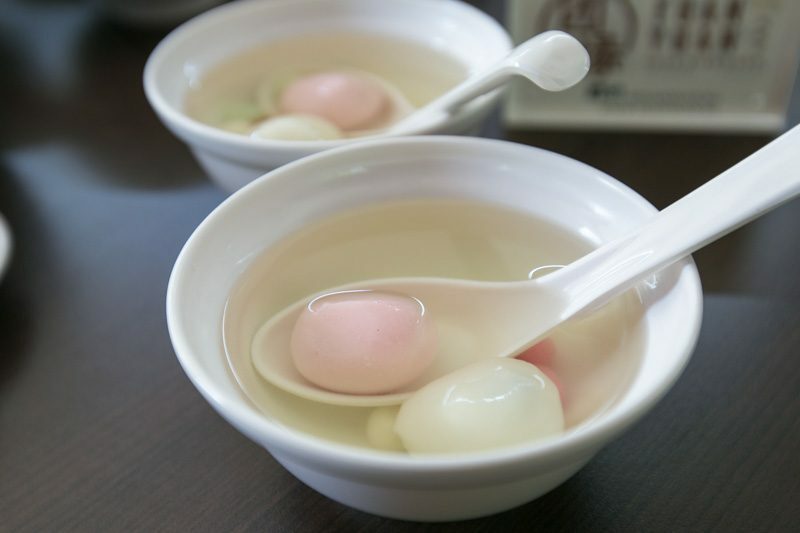 The glutinous rice balls are filled with Peanut and Black Sesame, and come in a pleasantly sweet soup to refresh your tastebuds after a whole lot of savoury soup. 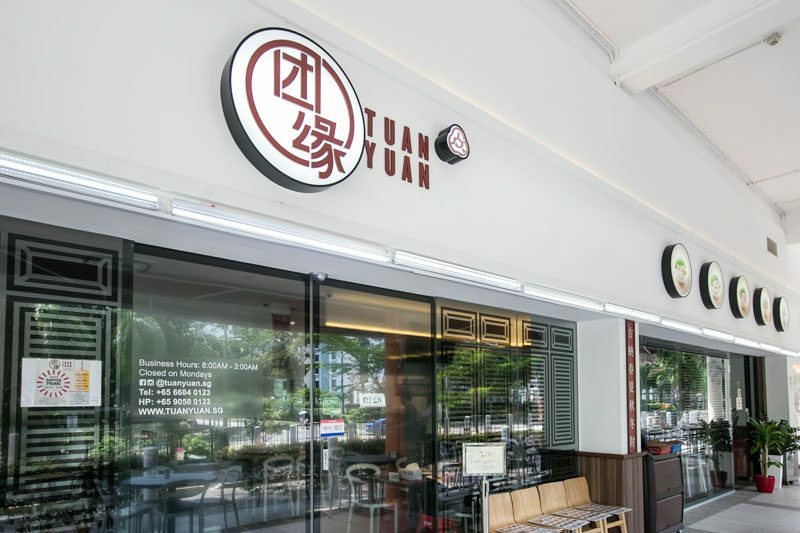 Perhaps the most interesting and ingenious addition to this Bak Kut Teh business is their newly developed mobile application named ‘Tuan Yuan’. The application utilizes QR code technology and allows customers to order in advance to minimise waiting during peak periods. I left very impressed by the amount of thought and heart poured into the business. Their mobile app “TuanYuan” quick ordering system is available for download on both AppStore and PlayStore devices. Just like online shopping, start adding your orders to cart at the comfort of your home or while you’re on the way to the restaurant! Customers can even choose the preferred level of pepper for all their soup based food items including serving non-pepper soup for the young ones, and if they want garnishes. Once assigned to a table, press the “View Your Order” button on top of the screen, and you may scan the QR code (The QR code represents your table number) that is placed on the table. Your order will be sent successfully to the kitchen and you can just sit back relax while waiting for your food to be served. It can save your order history too by creating an account with them! (Do take note to enable your device’s GPS/location services in order for your food order to be successfully sent) This absolutely saves time especially when you’re hungry or rushing. I think it all boils down to this: Tuan Yuan is definitely worth a visit for a bowl of solidly good Bak Kut Teh in Singapore. Waiting times can get pretty long during the weekend, so do consider getting their app or calling for reservations. Don’t miss out on Tuan Yuan’s present supper promotion which gives you 10% off your bill after 10:00pm, 15% off after 11:00pm and 20% off from 12:00-3:00am. Valid for Dine-In Only. Promotion will end on 30 June 2016. Like them on Facebook to keep up with their latest promotions and upcoming events! *This post was brought to you in partnership with Tuan Yuan Pork Ribs Soup.